AN UPSCALE MEETING & RECEPTION FACILITY IN THE HEART OF THE METROPLEX Mediterranean Villa, Dallas Fort Worth’s exclusive banquet and wedding facility and conference center, is located across from the Dallas Cowboys Stadium. Our venue can accommodate weddings/receptions, corporate and social events. Our facility is a stunning Mediterranean-style setting on 3-acre estate with lavish landscaping and breathtaking design and sophistication. We are a full service facility that leaves no detail unpolished. The Villa has over 15,000 square feet between the two luxurious buildings as well as a spacious courtyard and garden. Both buildings are decorated in warm, neutral colors with crystal chandeliers, marble floors, romantic lighting, Italian tapestries, Greek columns and recessed ceilings with etched gold trim. Each of the two buildings accommodates up to 300 guests making it the perfect location for your wedding, rehearsal dinner, corporate event or seminar. For more intimate affairs, Mediterranean Villa offers the Ambiance Lounge, a contemporary venue for events of up to 80 guests for those that want a striking alternative to the standard ballroom feel, is set with modern black leather furniture; progressive artwork, mirrors, and accent pieces; adjustable track lighting; a glass-front bar; and a black and white checkered dance floor. 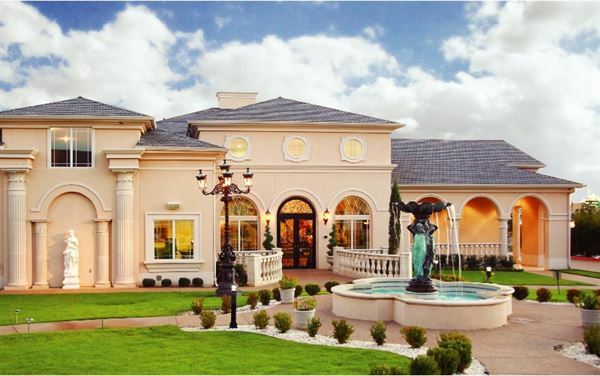 Mediterranean Villa is located in Arlington, Texas, right in the heart of the Dallas/Fort Worth metroplex within one mile walking distance from the new Dallas Cowboys Stadium, as well as the Texas Rangers Stadium, Six Flags Over Texas, and Hurricane Harbor providing a convenient location for all of your guests. The Wedding Chapel/Conference Center is a beautiful, two-level building that accommodates up to 300 guests, dressed in warm, neutral tones and lighting to accentuate the altar and stage at the end of the room. The room’s décor includes Greek columns and an impressive full size crystal chandelier that overlooks the marble aisle. A marble tile foyer with domed ceiling decorated with Cypress trees and classic European furniture separates two bridal suites. The Wedding Chapel/Conference Center is equipped with a baby grand piano, sound system, wall-mounted projection screen, podium, and microphones making it an ideal location for a theater-style conference, corporate holiday party, or company seminar or presentation. Ideal for outdoor wedding ceremonies & festivities, the gardens have a beautiful white marble gazebo, a fountain and an open courtyard centered between the two buildings bringing privacy and solitude to the courtyard for your perfect garden ceremony. Mediterranean Villa can provide services to indulge any outdoor event. To protect you in case of bad weather the day of your event, when contracting your event in our beautiful Garden, Mediterranean Villa will reserve the chapel at no extra cost to you. In case of inclement weather the day of your event, the ceremony may be moved to the chapel. diterranean Villa has three elegant reception venues for your Wedding, Reception, Corporate Event, or Party. Each of the reception ballrooms are dressed in warm, neutral colors with crystal chandeliers, romantic lighting, Italian tapestries, Greek Columns, recessed ceilings with etched gold trim, and optional room uplighting. The Grand Ballroom accommodates up to 300 guests, the West Ballroom accommodates up to 200 guests in a plated dinner setting, and the East Ballroom accommodates up to 150 guests in a plated dinner setting. Each ballroom includes round tables set for 10 guests with white linens and napkins as well as elegant, gold Chivari chairs. The ballrooms also include a wooden dance floor and wall-mounted projection screens. The VILLA Loft is an intimate and contemporary venue for events of up to 80 to 100 seated guests, is set with white floor length curtains, modern black furniture, striking scratched aluminum tables, dinner tables with premium silver linens, mirrors, adjustable colored lighting, glass front bar, black and white dance floor, and DJ booth with auxiliary cable for ipod or phone. This newly renovated, beautiful, one-of-a-kind room is perfect for intimate weddings, wedding after parties, birthday or anniversary parties, or even graduations and baby showers. Gourmet food stations or buffet settings are available.